Gorilla Playsets is one of the leading brands of playground equipment. 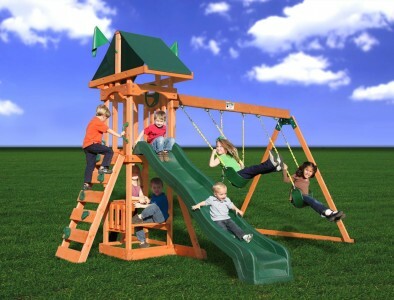 Since 1992, they have been selling high grade play equipment all over the nation. The company specializes in offering ready to assemble play sets to the customers. Gorilla Playsets use superior quality wood and plastic to design their commercial as well as residential playground equipment. All the play sets designed by Gorilla playsets are in conformity with American Society for Testing and Materials (ASTM). Also, the company follows all the Consumer Product Safety Commission (CPSC) guidelines to ensure kids' safety. Playground Equipment designed by Gorilla Playsets are constructed using heavy duty hardware such as electro-galvanized 5/16" and 3/8" diameter hardware. The hardware upgrade the strength and durability of the playground equipment. Moreover, instead of using regular nails, Gorilla Playsets utilize electro-galvanized wood screws to fix the different joints of their playground equipment. All the accessories in the Gorilla play set contains UV inhibitors, hence, does not get heated up in the bright sunlight. Some of the Gorilla play equipment also includes a fire retardant polyester roof for safety of the children. Gorilla Playsets offer their play equipment to the customers with 3-D illustrated easy to follow instructions. These can be easily installed with the basic tools in commercial and residential playgrounds.